Info "Send power to the little dude." 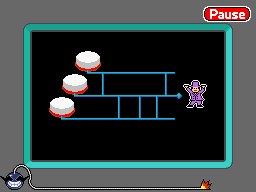 Circuit Path is one of Orbulon's microgames in WarioWare: D.I.Y. The aim of the game is to click the button that lights the wire to the dancing man. The player must follow the man's wire, turning whenever possible, similar to an Amidakuji game. If the player manages to light the man, they win. The game is lost if the incorrect buttons are pressed or if no buttons are pressed before the microgame ends. This page was last edited on July 17, 2018, at 09:47.